Music and art are alive at Sacred Heart Elementary School, where education isn’t just about feeding the brain –– it’s also about feeding the heart and soul. 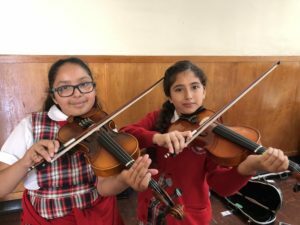 The students enjoyed expressing themselves this year through instrumental music, singing, art, dance and theater, all of which are important aspects of a well-rounded curriculum and help to develop the whole child. • First Annual Art Walk and fundraiser, which showcased art projects for viewing and for sale from all grades. Sacred Heart is a Transitional Kindergarten through Eighth Grade elementary school, situated and serving a diverse community within the Lincoln Heights area of Los Angeles. We are committed to teaching the charism of the Dominican Order: VERITAS (the seeking of truth in all things), which is a major influence within our school. Our educational program permeated by Catholic teachings and values provides an environment that envelops spiritual, academic, and social growth for all students.